HomeTravel news and articlesWhen is the best time to visit Tanzania? Tanzania is known as one of Africa’s best safari countries, and a safari in Tanzania is an opportunity for you to experience rich and varied wildlife in the country’s scenic national parks. But when is the best time to visit Tanzania? Read and learn more about Tanzania’s weather and wildlife all year round below. Please note: This guide is primarily aimed at those going on safari in Serengeti National Park. Tanzania is close to the equator and does not have winter and summer in the way that we do in the UK, but has a rainy season and a dry season. and the “small” rainy season in November. During the rainy season, you can expect some brief yet torrential showers that help freshen the air. Average daytime temperatures in Tanzania fluctuate over the year from 22–28°C, while the evenings are a little cooler. Regardless of the time of year you visit Tanzania, you can therefore count on warm temperatures. Tanzania offers some of Africa’s best wildlife experiences. 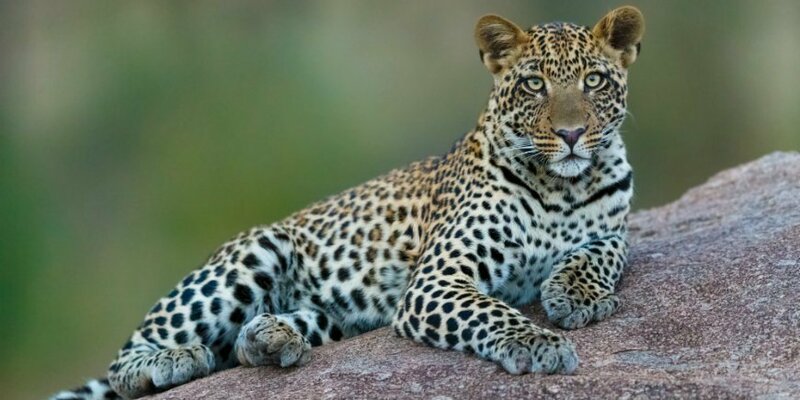 The East African country is home to “The Big Five”: the lion, the leopard, the elephant, the buffalo and the rhino – though the latter is a rare sight. The Big Five is an ancient hunting term used for the animals that are the most difficult and most dangerous to bring down. In addition to the Big Five, you can see wildebeest, zebras, giraffes, cheetahs, hippos, buffaloes and many other fascinating animal species. Serengeti also offers a rich and varied birdlife, with more than 500 bird species. 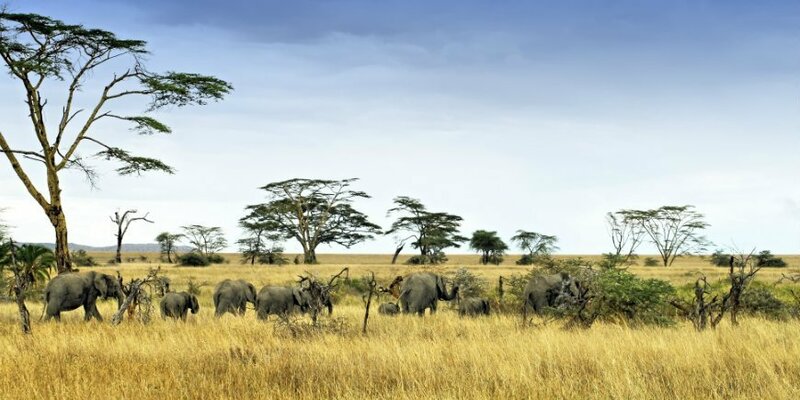 Serengeti National Park in Tanzania is also known for “The Great Migration”, when some 2 million animals, including wildebeest, zebras and gazelles, migrate from Serengeti in Tanzania to Masai Mara in Kenya every year in search of fresh food and water. Tanzania can be visited all year round, and regardless of when you choose to visit the beautiful country, you are guaranteed some amazing nature and wildlife experiences. 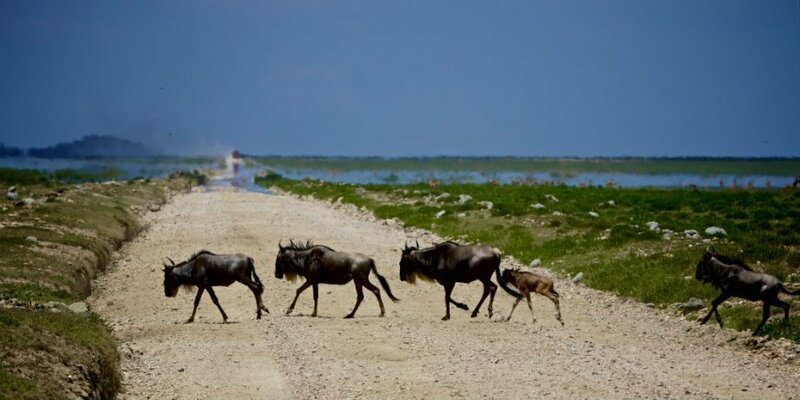 However, depending on what you wish to see, some periods are better suited for a visit to Tanzania than others – especially if you want to experience the Great Migration. 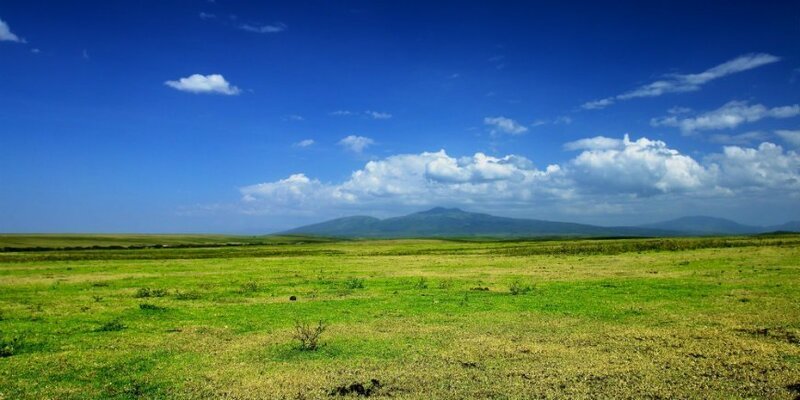 November to March are the hottest months in Tanzania, with average daytime temperatures of 26–28°C. The period starts with the “small” rainy season and is followed by an interim period of less rain. It is a beautiful time when everything is lovely and green. The months of February and March are the best if you want to see the wildebeest calves and zebra foals on the Serengeti plains. The newborn wildebeest are up on their feet in next to no time, and you will soon see them walking around with the rest of the herd. The last calves join the herd at the end of March. The young are easy prey for the large carnivores such as lions and leopards. If you are lucky, you might also see the predators hunting. November to March is also a good time to experience Serengeti’s bird life. The local birds build nests, and many birds from Europe and North Africa also migrate to the national park during this period. The temperature in the months varies, but you can expect an average daytime temperature of around 23–25°C. The “big” rainy season is in April and in the first half of May, and this is when most of the year’s rain falls. 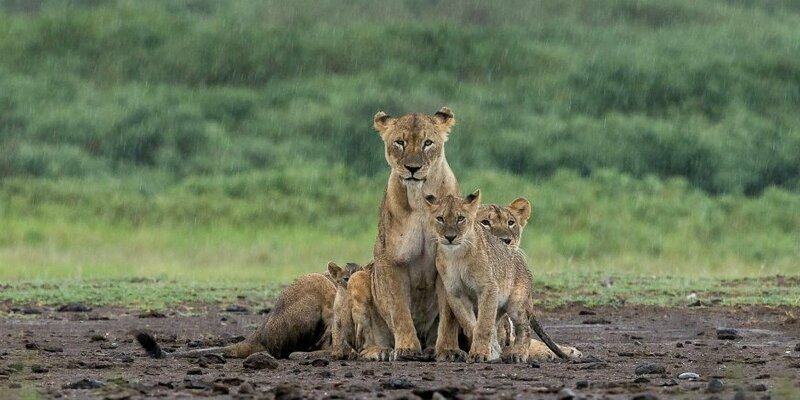 However, there is nothing to stop you going on safari in Tanzania in spite of the rain, as long as you are aware that there may be heavy showers. The rain makes for a lush landscape. 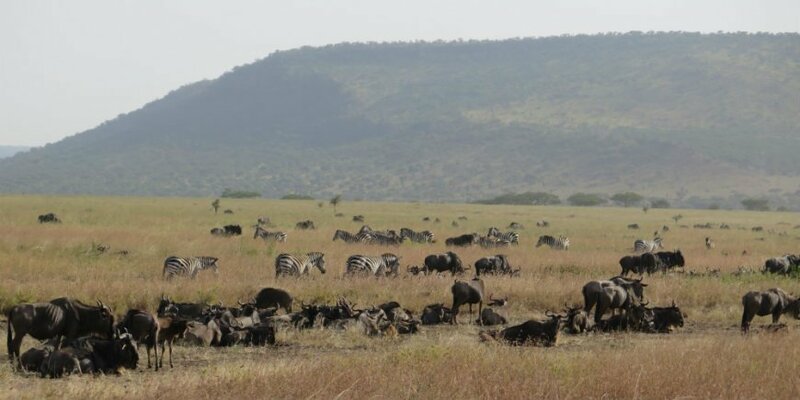 And although the longer grass makes it easier for the animals to hide, the park offers a high concentration of animals, so there is ample opportunity to experience the varied wildlife of Serengeti in the lush period. The rainy season is the equivalent of low season, so there are fewer visitors to the national park during this period. This generally means lower prices and the possibility of a more “intimate” safari experience. From late May to July, temperatures fall and you will now experience average daytime temperatures of approx. 22–23°C. The mornings and evenings can be chilly, so bring warm clothes. There is limited rainfall, and July is the driest month of the year. During this period, you can experience The Great Migration in the area at our wild camps in the mid- and western parts of Serengeti. The animals remain here for a period before moving on to the northern part of Serengeti. The dry weather makes for dusty roads, in stark contrast to the green landscape earlier in the year. However, in this period, you will see the animals gathering around the waterholes that still have water, and they will therefore be easy to spot. Many consider the dry season (until October) one of the best times to visit Serengeti because the weather is dry and you can experience the migration. It gradually becomes warmer, peaking at an average daytime temperature of around 23–25°C and up to 27°C in October. However, the mornings and evenings can be chilly, so bring warm clothes. At this time of the year, it has been dry for some time, and the landscape has turned from green to gold. As a result, the animals tend to gather around the few waterholes where they can still find water. During these months, the migration can be experienced in the northern section of Serengeti, near Kenya. The animals will be in the Masai Mara Game Reserve (Kenya) for a short time before returning to Serengeti from September to November. You might be lucky enough to experience the herds crossing the Mara River. The return of the herds depends on when the rain falls. 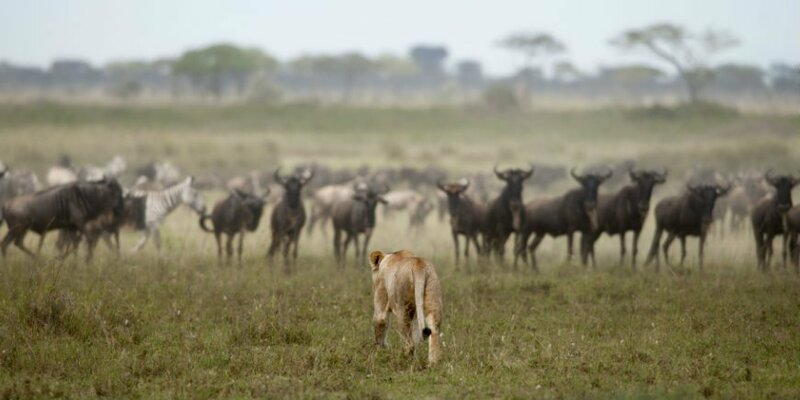 The return of the wildebeest to Serengeti means that there is now a lot of food for lions, leopards, cheetahs and jackals, and if you are lucky, you might experience the predators’ hunt for food. Please note that the above guide is a guideline only, and recommendations may change on an ongoing basis. If you want to be sure of arriving at the time best for you, please talk to our travel consultants. They have extensive experience of helping people to choose the right tour and departure time.